Here comes the last month of the year. Make it a December to remember. Spread merriness to your near and dear ones, and gift them handmade because these are always special. They have this intricate touch from the Artisans in them, which never fades away with time, such is the beauty of Handicrafts. I wanted to add some romantic vibes to my coffee mornings since long. That is the time when two of us can sit for a while facing each other, and then there are long talks, two souls become breathing windows which help to reduce the stress quotient. We’ve finished decorating our Christmas tree in the last week of November, as the little one was very much excited to do that, and now it’s the time to gather around it or should I say gather every morning? I couldn’t thank The Arte Collections enough for sending their unique Coffee Table Set Up right at the time of this festive season when Christmas is approaching and New Year is less than a month away. 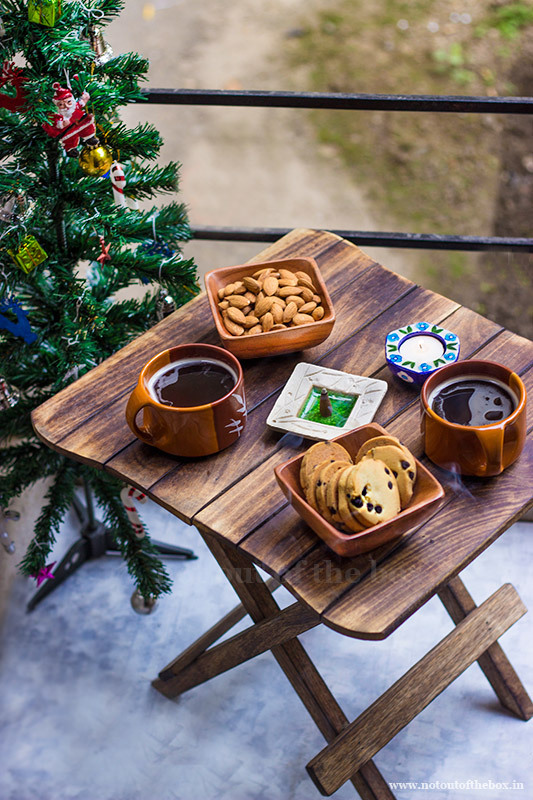 I wrote about their approach towards preserving the heritage of handicraft making in India in my previous post while exploring their Breakfast Table Set Up. They’re having more than 10 theme- based décor collections on their website, and the combinations of artefacts in each collection is very much utility based. With a reasonable price range, these are ideal for gifting and brings that classic old world charm into your home décor. The website is having a detailed description of each décor set, which helps the buyer to choose the things they’re looking for. Team Arte Collections source their handicrafts directly from Artisans who belong to the different parts of the country, so, there is no one in between the Artisans and Customers. In this manner, quality, pricing, and benefits for the artisans get assured. The baker in me gets super active during the winter, almost every day I bake either cookies or cakes. 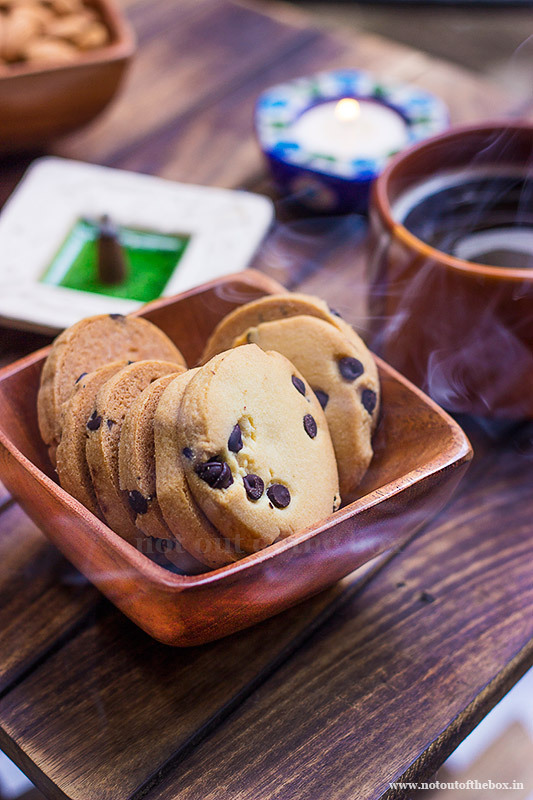 And it was a delight to see how the handmade wooden bowl from The Arte Collection’s Coffee Table Set Up doubled the beauty of my homemade cookies. Here I can say 100% handcrafted, aren’t they! I liked the smooth finish of these deep cut wooden bowls, they’ve added rich, classy charm to my cozy coffee table. The lighted blue pottery candle holder with all its warm glow is perfect for a romantic holiday evening. I placed and lit an Auroshikha incense cone on its ceramic cone holder which has some beautiful handcrafted patterns drawn on it, my whole room lifted up with a beautiful aroma, which lasted for long. 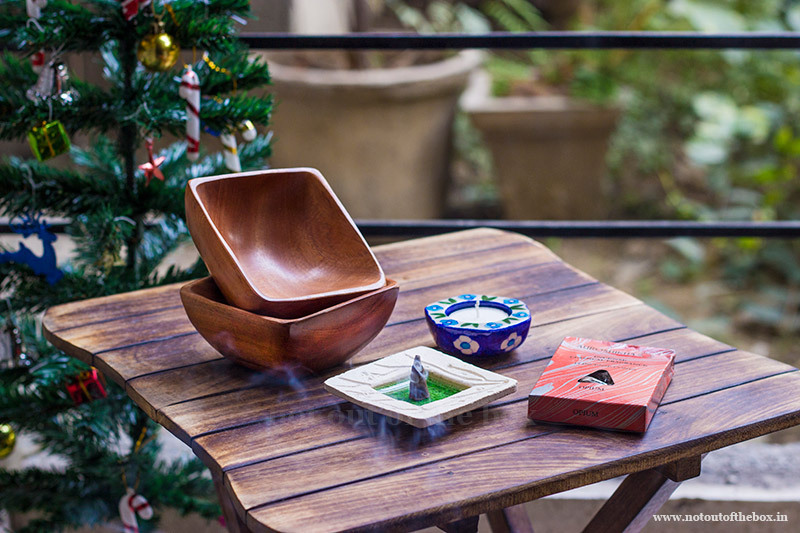 Nowadays it has become a ritual to lit an Auroshikha incense cone every morning. I’m addicted to its redolence, very charming. The Arte Collections is offering an exclusive 10% discount for my readers. The code is NOTOUTOFTHEBOX10, apply it at the time of check out. The coupon is valid through the entire http://theartecollections.com/ website till 15th May, 2018. Except their theme based décor collections, you can also make your own hamper by choosing individual products from their wide range of artefacts . I’m sharing the recipe of Eggless Orange Chocolate Chip Cookies below that I baked recently. Fresh Orange zest is the key factor in these cookies. They’re perfect companion to your cuppa. Mix All purpose flour, salt and baking powder in a bowl. Cream the butter and sugar in another bowl, add the flour mixture into this. Next, add the vanilla extract, chocolate chips and orange zest. Start mixing the cookie dough using your fingers, when everything comes together, make a log with the dough and wrap with cling film. Keep refrigerated for the next 1 hour. In between preheat the oven at 180 degree C, line a baking tray with butter/parchment paper. Take out the log from the refrigerator, unwrap, cut the log into 1/8 inch thick slices with a sharp knife and arrange them in the prepared tray by giving 1.5 inch gap between them. Bake for 10-12 minutes. The cookies will be soft after baking, but they will be hardened when cool, so, don’t worry about that. Let the cookies cool down for 4-5 minutes on the baking tray itself. Then shift them onto a cooling rack and leave there until they cool completely. Store the cookies in an airtight container.